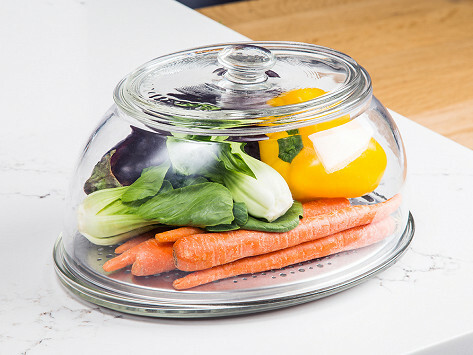 This glass-top produce container keeps veggies as fresh as the fridge can while it places them front-and-center in the kitchen. The dome keeps moisture in to prevent fruit and veggies from drying out, and the lid allows natural ethylene gas to escape to prevent wilting. Now when they are in sight, these good-for-you foods are more likely to be eaten. Dimensions: 12" x 9" x 7.5"
Works as well as described and looks nice too. Love the veggie dome. It looks so nice on the counter top and really does keep items fresher that don't want refrigeration, like tomatoes. it works for me can see all my veggies. We have ththiwell made vegetable/fruit keeper on our counter waiting for our trip home to start being put to use. Duncan Burns created VeggiDome to serve as a produce container that makes you want to eat your veggies. While it keeps vegetables and fruit as fresh as the fridge can, it also brings them to your attention by putting them on display where they are easy to see and reach. The freshness comes from the dome-shaped design and stainless steel colander. This creates the just-right humidity so produce won’t dehydrate or wilt, and the dome’s lid lets natural ethylene gas escape, which also helps boost freshness. It stores several days worth of fresh stuff inside, and works well with fruit you want to ripen, like peaches and plums. While it serves as a visual reminder to snack healthier, the container can also help reduce food waste. On average about 30% of the produce we buy is forgotten and then tossed out. But with VeggiDome, it is no longer out of sight, out of mind.